BACKBONE, the critically acclaimed new show from the award winning circus and physical theatre group, Gravity & Other Myths, has been announced for the 2018 Galway International Arts Festival. Backbone promises to feature jaw-dropping virtuosity, yet with disciplined teamwork and choreography, and be a thrilling, high-octane, exploration of human strength. The Sydney Morning Herald declared the show, "circus at its best"; InDaily called it, "circus, as you’ve never seen it before...a visual extravaganza"; Limelight said it had "a perfect combination of fluidity, mettle, and danger"; while The Barefoot Review said "the performers’ agility and stamina are beyond impressive." The show will run in the the Bailey Allen Hall, NUI Galway at 7pm from July 17 to 21 July, with a matinee at 2pm on July 21. 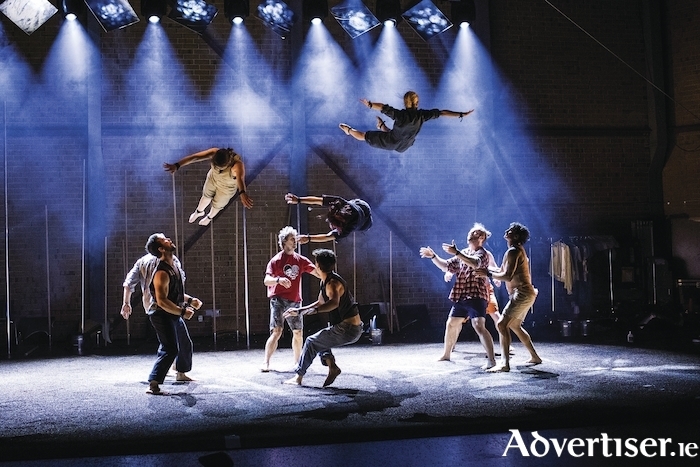 The acrobats are Martin Schreiber, Lachlan Binns, Jascha Boyce, Jacob Randell, Lewie West, Lewis Rankin, Joanne Curry, Mieke Lizotte, Lachlan Harper, and Jackson Manson. The director is Darcy Grant. Formed in Adelaide in 2009, Gravity & Other Myths have won numerous awards, such as the Audience Choice Award, Theater Spektakel 2016, the Australian Dance Award 2015, the Greenroom Award Outstanding Circus 2015, and the Adelaide Fringe Festival, Best Circus 2014, all for its show, A Simple Space, which the company performed at the 2016 Galway International Arts Festival.